Investing the appropriate amount of time into sleep is a key principle for attaining optimum health. Everyone is guilty of giving up some quality sleep time for something else, oftentimes attempting to ‘make it up’ later on. While you can’t perfect your sleep schedule 100% of the time, getting sufficient sleep most of the time could be the solution to a number of troubles you currently face. Although many of us do make a real attempt to go to sleep early and put in a healthy amount of time, all too often people are spend much of their time in bed not sleeping. With 60 percent of adults not getting enough sleep, the average American spends 7.5 hours in bed while only sleeping for 6.1 of those hours. Unfortunately, to solve sleeping issues many individuals turn to sleeping medication, but this ‘solution’ completely ignores the underlying problem while also leading to an increased risk of cancer and premature death. The amount of hours to constitute sufficient sleep varies based on age. Children generally need 10-11 hours per night. Adults generally need 7-9 hours per night. It is important to recognize that lack of sleep can result both in health decline and work decline – ultimately putting a significant damper on your day. Sufficient sleep has been shown to be essential for academic success in children, while a lack of sleep could be contributing to excess weight. In fact, sleeping only six hours a night increases the risk of being overweight by 27 percent and may lead to an extra 14 pounds a year. Additionally, those who sleep less than 6 hours increase their chance of heart disease by 48 percent, while women who sleep less than 6 hours increase their breast cancer risk by 62 percent. All the while, the quality of your work and day in general dwindles. With alertness being impaired by 32 percent for every 1.5 hours reduction in sleep, it is no wonder more mistakes are made in the work place and on the road. Sleepless drivers help to make up 20 percent of motor vehicle accidents, while sleepless doctors have twice the amount of surgery complications between procedures. 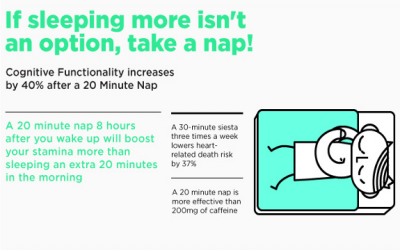 Fortunately, a 20 minute nap can lighten your day, boosting cognitive functionality by 40 percent. Taking a nap 8 hours after waking up boosts stamina more than sleeping an extra 20 minutes in the morning, and is more effective than 200mg of caffeine. Your statement, "sleeping just 6hrs a night could result in 14lbs weight gain a year". That is just not true. I have been sleeping 6hrs/night for the past 30 years and I have kept the same weight of 117lbs since I was 25 years. I am now 69 years. I don't know where you get your statistics from? I also feel completely rested and alert with 6hrs of sleep. Maybe I come from a different planet. ? But I know one thing, different people have different sleep needs. Put this on your record.